Burning Man 2017 marked my eleventh burn in a row and the first year that I brought a piece of art to the playa. WORDLESS was a large three-dimensional word made out of wood. It stood 10 feet high and 40 feet wide. 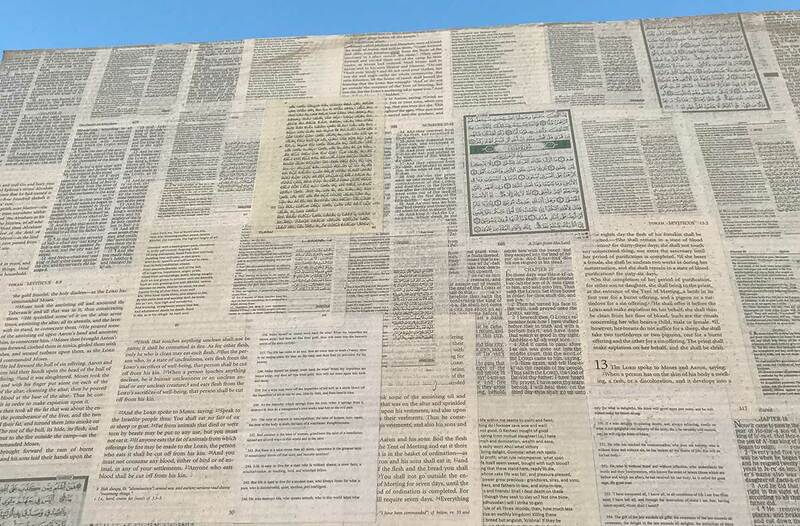 The word that was displayed was “WORD” and the surface of the structure was covered in pages of scripture from many of the world’s major religions: the Torah, the Bible, the Koran, the Bhagavad Gita, the Dhammapada, and the Tao Te Ching. The structure had a hidden sound source embedded inside it which emanated a deep rumbling “OM” vibration. A circular perimeter around the structure was lined with meditation benches, inviting people to sit and just be for a moment. The structure itself was burned on Friday morning as the sun was rising. The original idea for WORDLESS was seeded a couple years ago, loosely inspired by the word sculptures that I had seen on the playa. I think the idea started as something like, “what if you had a word and it said WORD!” As the concept evolved, I associated the biblical reference to John 1:1 (“In the beginning was the Word, and the Word was with God, and the Word was God.”) and thought of covering the word in pages of scripture from many different religions. When I first thought of the idea it seemed far too controversial and I didn’t feel like I was in a place to work with scripture in that way. Burning Man 2016 brought the project back into my mind and gave me a deeper sense of clarity about the intention behind the work. I came out of that burn feeling a sense of wholeness and surrender. I had what you might call a mystical experience – a brief glimpse into something that felt very much like God. It’s hard to explain the experience but it was so simple – God just is and is everything and we are an expression of that. The experience profoundly affected me and formed the basis of my intention for the WORDLESS project. Beyond the dogmas, creeds, and metaphysical ideas of religion, there is immediate experience. It is from this primal world that living faith arises. In 2017, we will invite participants to create interactive rites, ritual processions, elaborate images, shrines, icons, temples, and visions. Our theme will occupy the ambiguous ground that lies between reverence and ridicule, faith and belief, the absurd and the stunningly sublime. The human urge to make events, objects, actions, and personalities sacred is protean. It can fix on and inhabit anyone or anything. This year our art theme will release this spirit in the Black Rock Desert. Part of what I wanted to convey was this idea that we add so many layers of abstraction and interpretation on top of something that is so simple. People create complexity – all these rites, rituals, and tasks that must be accomplished in order to connect with God – when the truth is we are a perfect expression of God as we are and we are closest to that aspect in the depth of our own being. This is why the project was called WORDLESS. First, because this aspect of God is impossible to truly capture in words and, second, to symbolically burn away all these words and layers of abstraction to just be with ourselves as we are. Scripture speaks of word, vibration as the source of all creation. Humans are endowed with this power of spoken word. We use words to create the world we live in. Our understanding of ourselves as an expression of creation, created in the creator’s image, and creators in our own right is the foundation of conscious creation. Thus we are confronted with the power of our own words. And we burn the word to reestablish our connection to the word, to the purity of our own use of the word, and the purity of our own understanding of ourselves as expression of God’s vibration. We let go of all the concepts that we have created on top of the word to just be as we are. I had an opportunity to engage with many different people from different faiths about their reaction to this work. The most sensitive aspect of the project was my intention to burn the scripture. Jewish people, in particular, had a very hard time with the idea. It was Hari Kaur, my Kundalini yoga teacher, who emphasized my own lack of grounding in the subject. Although devotion to God is at the heart of my daily aspiration, I do not have any formal background with religious tradition or scriptural study. As one Rabbi I spoke with put it, it’s very easy to make a strong statement using a medium that means little to you and everything to someone else. I found this aspect of my relationship to the subject matter troubling. In my heart, I felt that it was ok for me to work with scripture as a medium but I also felt that I had to bring more mindfulness to my understanding of what I was working with. I enrolled into a series of religious literacy courses out of Harvard on EdX. The first course I took was on Judaism and it made me appreciate just how central the Torah is to the Jewish identity. My continuing conversations led to the insight that burning scripture was profoundly disrespectful to some of the traditions represented in the texts I was using. It was hard for me to assert a message about being and acceptance while simultaneously disregarding the beliefs of the traditions I was working with. After some deep consideration, I decided to burn the word but not burn the scripture. 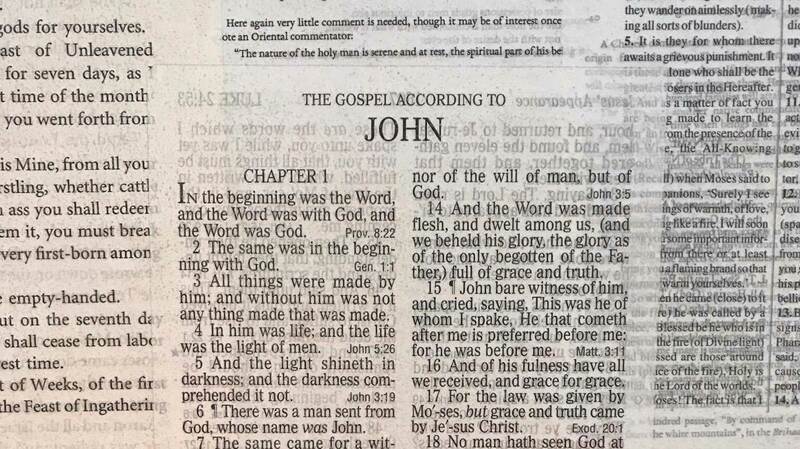 The scripture itself was to be removed just before burning the word. In retrospect, this was an interesting compromise. At heart, my intention was to convey a message about going beyond words (scriptural or otherwise) to a deeper essence – to recognize the inherent simplicity of divine presence inside ourselves and everyday life. Part of the experience was the provocation of being confronted with the action of burning scripture as a catalyst to examine one’s spiritual values. Not burning the scripture made the project much more fundable and it made it easier for people to get involved because the project was not intrinsically offensive to anyone. 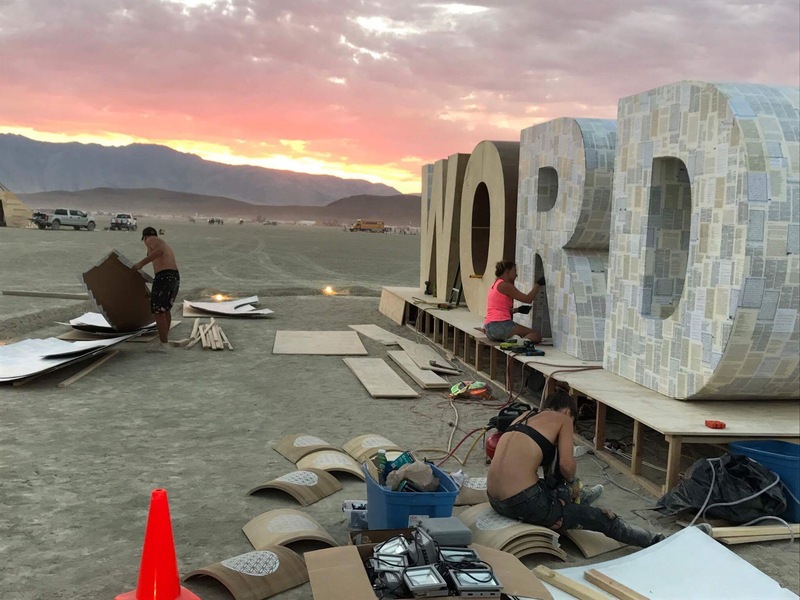 Over 30 people contributed to funding the project, and as many showed up throughout the week of Burning Man to support the build and burn process. Would the burning action have made a significant difference in the experience of the piece? I am not sure. In the end, a level of compromise was reached through a process of extended dialog, weighing something that I felt strongly about against something that others felt very strongly about. Perhaps that, in itself, is a major source of insight and growth for all involved. Interestingly, despite my desire to burn the scripture, treatment of the scripture was one of the most challenging aspects of the project for me. I felt a responsibility to be very respectful of each page I dealt with. First, at this scale and working in these conditions, it was very difficult to be delicate with every page I touched. But the real challenge was that I couldn’t extend my own sentiment to all the people that came by to help us and certainly not to all the people who experienced the piece after it was built. Simple things like treating the scripture with care, not putting the scripture on the ground, or not stepping on the scripture. There were many times I came by to see people climbing all over the piece. There was little I could do about this and it was very much an exercise in letting go. In a way, the project was a metaphor for the many varieties of interpretation possible with scripture. Each person I spoke with had a slightly different interpretation of the piece. For one of my partners building the project, Krasimir, the project symbolized unifying all religions into one religion. For another good friend of mine, the project was about words and how we use them. For some, it was an opportunity to lose oneself in reading snippets of scripture that presented meaning in the moment or simply a place to sit and meditate. For others, especially those who only saw the structure from a distance, the piece was a tongue in check satirical reference to all the words seen on the playa. For me it was all those things, but mostly a desire to manifest an experience that would bring people into presence with themselves and God in some way. As a side note, the experience of working on this project has opened up a whole new field of interest for me. I realized that the formal study of religion captures many of my many interests: governance, economy, education, philosophy, history, spirituality, community, dialog, art, and even technology. I am currently enrolled in my third online religious literacy course and this subject is increasingly becoming a focus of my study, art, and work. Issues of religion are sensitive and this project was particularly provocative in that regard. The intention here was not to offend, but rather to encourage deep exploration and dialog around the meaning of spiritual values and identity. In that sense, it was very important for me to get as many people and perspectives involved to give the project more legitimacy. One of the biggest highlights of this project was the incredible number of people that came together to make it happen. My wife, Natasha, spent countless hours supporting me in virtually every aspect of this project and Krasimir Alaykov, Natalia Rudakova, George Bakardjiev all joined as part of the dream team that spent endless hours in brutal conditions bringing the word to this world. Krasimir led the build effort and was instrumental in realizing every physical aspect behind the project. He is a master craftsman and his incredible attention to detail truly blew me away. Much of the project was pre-built at Ivenson Ranch, just outside Black Rock City. JB runs a whole Burning Man art support service there and I was deeply touched by the support and kindness I experienced there. JB truly puts Burner spirit into practice with his operation. I was also deeply touched by the support of Camp Merkabah. I still can’t believe how many people showed up to the burn at 5 am! From funding to build to burn, many people from the extended Merkabah community stepped up to offer tremendous help in making the project happen. Tommy Rom and David Shemesh in particular were instrumental in making the project a reality. Actualizing this project was a tremendous experience for me. Literally every aspect of this project was community supported. I was deeply moved that almost 40 people came together to fund the project (we raised just over $13,000 between the camp, individual contributions, and a crowdfunding campaign) and many people contributed in other ways. Working with the Burning Man organization itself was also a great experience. Annie Coleman from Art Support Services and Doxie from FAST (Fire Art Safety Team) were super professional and guided me every step of the way through my first art project. Both pre-playa and on playa, every request we made was handled in a timely manner and I felt really supported throughout the whole process. On the playa, the project itself took a tremendous toll on me physically and was brutally difficult. Building the structure, doing gas runs every twelve hours to keep the generator running, preparing to burn it, burning it, then cleaning the ashes was a non-stop responsibility during the week of Burning Man. Natasha and I both ended up with severe colds and were completely knocked out by the end of the week. Creating art on the playa helped me appreciate just how much effort goes into every piece of work out there. It’s a serious commitment. One of my favorite moments of the week was early during the build. It was around midnight and we had been working non-stop on the playa since 9 am. Our last meal had been around lunch time. A lone white van pulled up and a guy asked if we were hungry. I’m one of those super picky eaters (vegetarian, gluten and dairy free) so I was a little apprehensive. He mentioned something about Spanish style tapas, which sounded like it might have potential so I said sure… ten seconds later two pick up trucks pull up ranger style and two or three dozen people all dressed up in party gear jump out. Dance music starts playing, a large table is set up, and huge platters of gourmet food come out – cucumbers with gazpacho soup, roasted peppers, quiche, all sorts of fancy cuisine. This happens in the space of about sixty seconds. Mind blown. One of my all time most memorable moments on the playa. A very big heartfelt thank you to Feed the Artists for creating this magic. It truly touched my heart. I have learned so much through this experience and received so much on a personal level. I am forever grateful to Burning Man and the incredible people that make it happen. 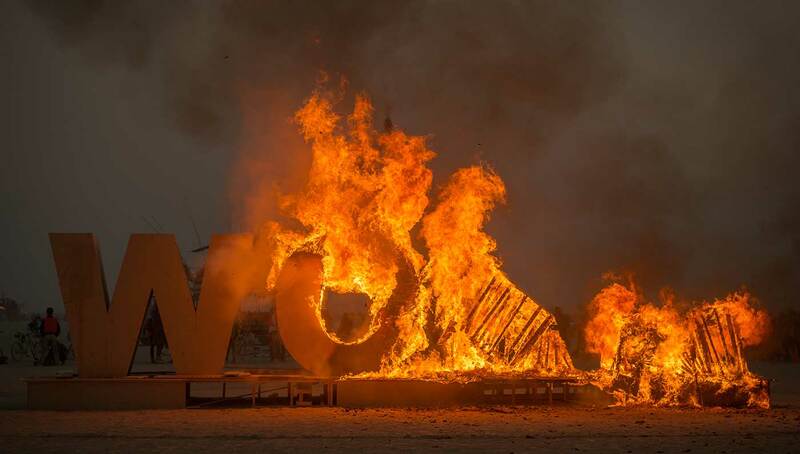 So many people give so much to make Burning Man what it is and I am just deeply honored that I have had a chance to contribute back to this community somehow. Thank you, thank you, thank you. WORDLESS emphasized that God, or whatever notion of creation origin we might have, is inherently indescribable. Thus we acknowledge the word and simultaneously burn it to acknowledge the wordless source from which all words and things emerge. It is my sincere belief that as more people find this common source within themselves many of the challenges facing humanity will be addressed in a more constructive and harmonious way. Special thanks to Geoffrey Squier Silver for taking the top most photo of me sitting in front of the word. I really enjoyed reading this. My name is Noaa and I was one of the people from feed the artist that stopped by to feed you guys. You were one of my favorites. Your passion expressed when you explained about your piece and the group om was one of my most memorable moments at BM this year and that’s why feeding the artist is so gratifying. That’s why we do what we do. Our expressive Word. Thank you for your art! Thank you Noaa. Your group coming by was also one of the highlights of my burn. What you guys do is amazing! Great job Astro Man. I’m so proud of you for manifesting your dream against all odds. Very immersive. You made me proud. Thank you brother. And thank you for all your help! This piece touched my soul. The healing vibrations of OM and the visual art shifted and healed pieces of me. A piece of me that has felt betrayed by religion. And my time with this piece helped heal a part of me that has been suffering. Thank you for your gift to the community. Thank you Shaina. Your comment means a lot to me. Wow – thank you for sharing Lorenz. I am deeply moved. I feel a sense of liberation reading about your process from start to finish and seeing the vision manifest. I love how you created space for a somewhat “taboo” topic, as we know religion has left a bad taste in many of our mouths. Yet, with your art you were able to inspire a new conversation, one that points to the relationship between the word and wordless, the form and formless, the finite and the Infinite – all of which looks very different to each individual. The synchronicity of the Burning Man’s 2017 theme and this project on the playa is certainly no accident. When thinking of where religion or spirituality fits within the container of BM it seems natural that participants may feel uncomfortable or uncertain, and perhaps even triggered by memory of past traumas. Nonetheless, the beauty of BM resides in its power and potential to deconstruct and heal, encouraging one to be with themselves and have those difficult conversations. I imagined WORDLESS gave them permission to do so, opening up to that place within where God resounds. And yes, some of the 70,000+ attendees may have been completely unaware yet still touched by the vibrations. I’d also like to acknowledge your decision to compromise, which to me exemplifies one of the ten principles: radical inclusion. Burning Man has taught me that what happens on the playa doesn’t stay on the playa. In fact, what happens on the playa is to be taken out in the grander workshop called life. Thus, incorporating cultural sensitivity is important whether in Black Rock City or elsewhere. I see it also as a radical act of expression when one can go beyond their own identity and consider that of another – not in the sense that we limit ourselves for the sake of pleasing the other; rather we practice and understand that the “other is you.” More so, compromise leads to collaboration that leads to building and growing community. I recently heard an elder affirm: community is the new spirituality. 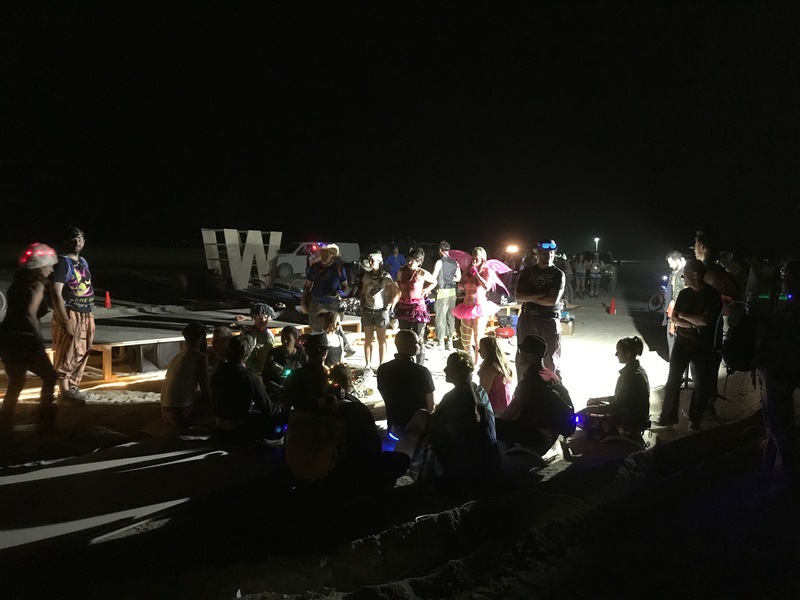 Burning Man is a prime example of collaboration; I recognize that the event could benefit from more projects that convey different cultural conversations and provide support for participants to navigate difficult or unknown territories. I can foresee how Burning Man will continue to be a landscape for evolving human thought and relationship. Lastly, personally there is an unexplainable resonance that touches my soul. It may be the reminiscing of sunrise and sunset playa vibes, or the feeling of home that I get from your pictures. It’s people like you that inspire and make real what is possible within my own life. I hold dearly my own prayer to bring sacred art and space to the Burn – a place where people too will be reminded of the silence amidst chaos, their connection to the cosmos, and a sense of Self in everyone and God. I celebrate your journey. In dust we trust. Thank you for the deep reflection. Compromise was definitely one of the big lessons here. For me it was a subtle ground between staying true to something that I felt wanted to be expressed and compromising in a way that maintained the integrity and essence of that expression. Even as you highlight it now, it brings to mind that there is much to reflect on in this art of compromise. In dust we do indeed trust. Sat nam!